“Eclectic” can only begin to describe Sunset Park, the Brooklyn enclave which slopes up from the coastline of New York Harbor on the west to 9th Avenue on the east. North to south, Sunset Park spans the area between the Gothic Revival treasure Green-Wood Cemetery and the neighborhood Bay Ridge. Known for its Romanesque and Renaissance Revival architecture, Sunset Park is the largest historic district on the National Register of Historic Places in the Northeast U.S. A variety of businesses fill its avenues, while its side streets are lined with two-and three-story rowhouses, most dating to the early 1900s. Originally settled by the Dutch in the 1640s and site of the first cooperative housing building in the United States, Sunset Park is now home to people of many origins, Chinese and Latino residents foremost among them. In the 1980s, Sunset Park became the site of Brooklyn’s first Chinatown, located along 8th Avenue from 42nd to 68th Street. Between the bevy of specialty food shops, festive annual Parade of Flags down 5th Avenue, and family-centric culture held dear by Sunset Park’s nearly 150,000 inhabitants, you’ll find all the fun of a diverse neighborhood with the comforting feeling of home in under two square miles. 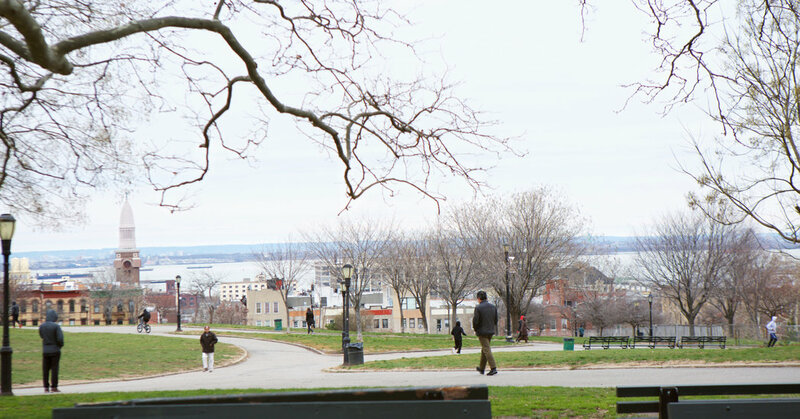 Sunset Park’s eponymous green space covers nearly 25 acres and affords tremendous views of tugboats in the harbor, the Statue of Liberty, and Manhattan’s high-rises. The six-million- square-foot (you read right) Industry City, a former waterfront manufacturing complex, now provides operating space for 400 companies, along with an extensive food hall, art galleries, and periodic events like movie screenings and craft fairs. The D train at Ninth Ave and 39th St [OR at 36th St and Fourth Ave]; [The R train at 36th St [OR 45th St, 53rd St, or 59th St] at Fourth Ave; and the N train at 36th St and 59th St at Fourth Ave [OR at Eighth Ave and 62nd St—between 30 and 40 minutes to Midtown.